Skepticism or even cynicism toward smart speakers is quite common. Their usefulness and security are often questioned, but new studies, as well as bit of common sense, suggest they can be immensely beneficial for the elderly. These devices can help seniors maintain a sufficient degree of autonomy, but can they be digital companions too? In the past 20 years technology has been evolving so quickly that adjusting to it can be a challenging task for older adults. In the past two decades, for example, mobile phones transformed from devices with physical buttons used for calls and messaging to touchscreen pocket computers. However, while modern touchscreens are self-explanatory and easy to use, the operating systems and user interfaces of these devices are not always the easiest to navigate for seniors. This is where the argument for smart speakers comes in. What's more instinctual than asking questions and communicating the same way you would with another person? Not only that - smart speakers are vastly more accessible than smartphones, tablets or PCs for those suffering from vision problems, Parkison's or other ailments. And, of course, they can be beneficial when taking on daily tasks and for helping seniors maintain a sense of independence. So what does an Amazon Echo or a Google Home device offer the elderly? 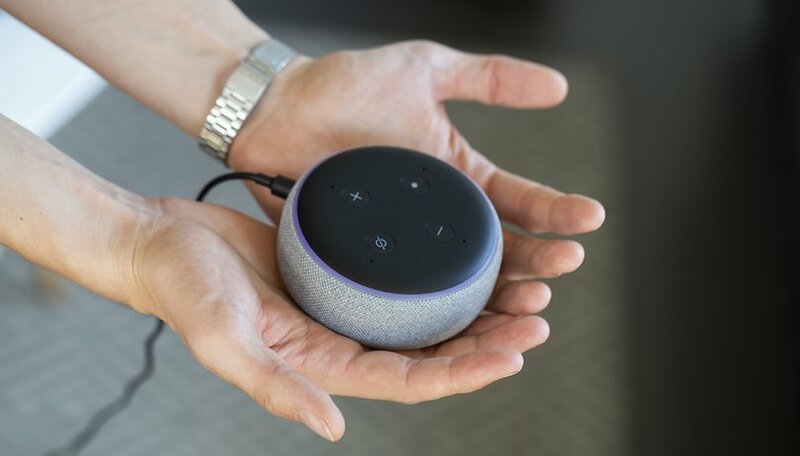 As part of a larger Internet of Things feasibility study, researchers from the University of Washington and the University of Pennsylvania had older adult participants install smart speakers in their homes for 2 months. Most responded positively to the devices, often utilizing them for medication reminders or asking practical questions. But Alexa or Google Assistant can help with much more. When connected to other smart home devices, like smart bulbs and thermostats, they can help seniors or anyone suffering from mobility problems become more independent. Being able to turn off the lights or turn up the temperature without asking someone else for help can certainly be freeing, as many have attested to online. The same goes for ordering groceries and other necessities online through smart speakers. Nevertheless, those with hearing problems will have a hard time with smart speakers. A smart speaker can also help seniors with their daily schedule thanks to the option to set routines on the device. Waking up can be followed by the lights turning on, thermostat turning the temperature up, medication reminders and more. This can especially beneficial for older adults who live by themselves. "Alexa’s usual bright blue signal ring…shows bright greenish-yellow, and a bell rings…and one of my friends has left me a message. Yes, we could wait ’til we saw each other in the lobby. Yes, we could use the telephone. But there’s something so personal and private AND FUN about using Alexa. I haven’t had this much fun since we were kids and string a wire between two tin cans and played ‘telephone’." Marvee, an Alexa app designed specifically for older adults can also help them send and receive text messages with its ability to transcribe voice snippets into text and send them to contacts. It's a great way for seniors to stay connected to their family without the hassle of using a smartphone or trying to reach relatives on a landline. It even offers a “Morning Beacon” you can send to loved ones by saying: “Alexa, ask Marvee to say I’m OK.” Anyone on the list of selected contacts will receive the notification by text, email or both. This is especially important considering multiple studies have found that older adults often feel lonely and socially isolated. If you are familiar with smart speakers, you'd know that they can do a lot more than just order things online and tell you the weather forecast. You can play games with them, ask them questions, request for them to play your favorite song and more. This had led to suggestions that interactions with these smart assistants can alleviate loneliness, especially among senior citizens. But in my view, they are only a temporary solution. Of course, providing entertainment and keeping older adults engaged with interesting activities is unquestionably positive. However, in my opinion, it can never truly replace a connection with a real human being. First of all, current AI assistants are not at the level of Samantha from the 2013 film Her - they don't really understand or have emotions. So, can you really bond with today's AIs? To me, it seems like a band-aid slapped on a bullet wound. Social isolation and the depression that often results from it can't really be waved away with smart speakers. Like any other age group, seniors need actual human interaction and support. It's understandable that relatives and loved ones can't always be there, but in my opinion, in many cultures there's also the tendency to abandon older adults or treat them as a burden. Alexa can't solve this. There needs to be more community support and involvement like organizing activities for the elderly - especially for those that don't live in retirement communities. That doesn't mean smart speakers won't come in handy for all the other tasks described above, but for now the devices will remain what they should be - useful tools, not a replacement for companionship. What is your opinion on the matter? Let us know in the comments. Perhaps yes, but personally I am still not very positive about smart speakers.